Last Saturday I went to my second children's literature conference. Like the last one, it was a small local conference hosted by a nearby college, but this time by the education department rather than an LIS department, so it had a little bit different slant, and was attended primarily by teachers rather than librarians. But, I have to say I liked it much more than the previous one. The first one I attended had only 2 keynote speakers, and despite being good, the sessions were just too long. Then there were 5 shorter breakout sessions led by others that were very hit and miss, and it wasn't over until 6:00 (not counting the formal dinner with a 3rd speaker that I didn't stay for). The conference today was the reverse, 5 keynote speakers and only 2 breakout sessions, and they were all just 45 minutes in length, so the day was over by 4:00. It was just right! There weren't many sessions to choose from during the breakouts, and they weren't very applicable for public librarians, but ALL 5 of the keynote speakers were phenomenal! 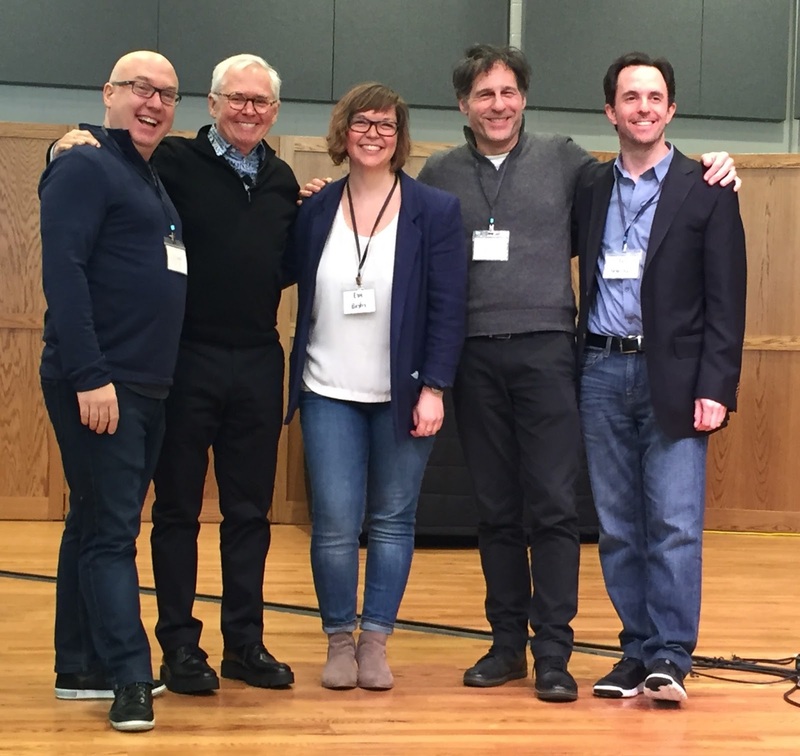 They are pictured above, from left to right: Aaron Reynolds, Marc Brown, Erin Barker, Peter Catalanotto, and Marc Tyler Nobleman*. Aaron Reynolds was the whole reason I decided to attend. I love his Creepy Carrots and Creepy Pair of Underwear, and after seeing a video of him lip syncing and dancing to Britney Spears' "Oops, I Did It Again" I really wanted to meet him in person! He was very entertaining (no surprise that he has a theatre background). He shared that he had no interest in reading until his 5th grade teacher read Ramona the Pest to the class, and then he was hooked! He talked about the importance of not giving up, sharing that he received 390 rejections before his first book was published! He closed by performing Creepy Pair of Underwear, and later was kind enough to sign books and pose for a picture with me. 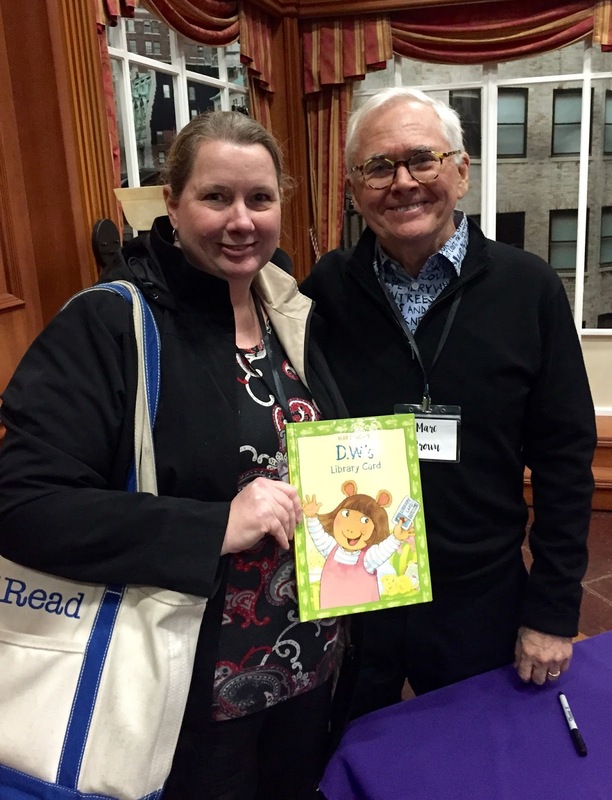 Marc Brown, the author of Arthur (try saying that 3 times fast), was another reason I wanted to attend to get a book signed for my niece, who when she was around 4-5 bore an uncanny resemblance to D.W. He was very nice, sweet, and soft-spoken during the meet & greet, and turned out to be surprisingly funny during his presentation. He told a bit about his background and how his grandmother and great-grandmother inspired him with their storytelling (his grandmother made her scary stories even more scary by taking her teeth out! ), and shared funny and interesting stories, like the time Barbara Bush made catty remarks about Nancy Reagan while giving him a tour of the White House, or the time he traveled to Russia with Laura Bush and met Putin, and was later tackled by a Secret Service agent for taking a picture, which he pretended to delete, but really didn't. He closed by reading a favorite of mine, Wild About Books, which he illustrated, but was written by Judy Sierra. Erin Barker is one you are likely not familiar with as she is just breaking into the kid lit game, but she is an alumnus of the school that was hosting the conference. She has done graphic design and illustrations for other kinds of projects, but her first illustrated children's book, a board book called What Is Soft? with author Susan Kantor, will be released next month. She shared some of her work and her process for developing characters, and talked about how it evolved and realizing that she really wanted to illustrate children's books rather than do graphic design. Peter Catalanotto was not a name I recognized right away, but I did recognize some of the books he has written and/or illustrated, such as Monkey & Robot as well as others by such notable authors as Cynthia Rylant, Mary Pope Osborne, and Ella George Lyon. 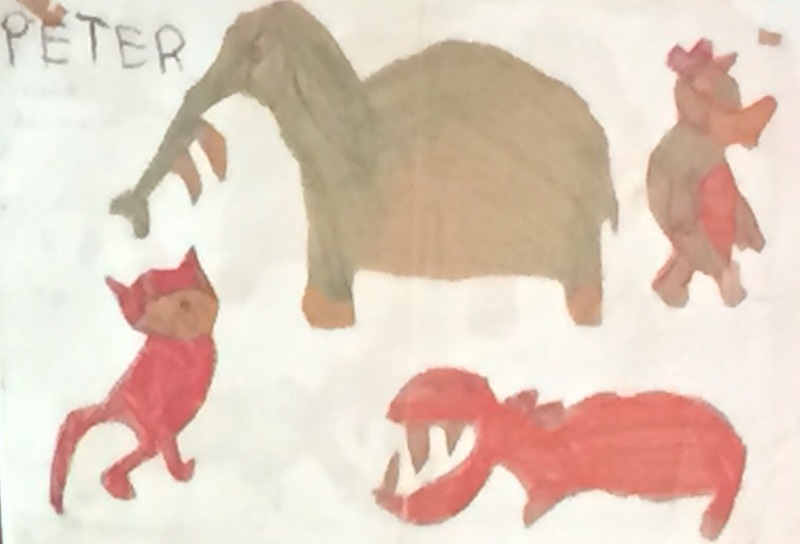 Like the others, he talked about his childhood and how his interest in writing and illustrating developed. As it turns out, he first childhood career choice was a bookmobile driver! He talked about having dysgraphia, and how it was much easier for him to tell a story with his art than with words (some of his early art is pictured), and his teacher, then later his publisher, encouraged him to use that to transition to using written words to tell his own stories. He emphasized leading with a child's strengths, and like Aaron Reynolds, not giving up. And last, but not least, Marc Tyler Nobleman. This was another name I did not recognize, nor was I familiar with any of his books, but his presentation was very interesting. He is a fan of the superhero genre, and talked about two non-fiction children's books he wrote about the history of the development of the Superman and Batman characters. The story of the never-credited and nearly forgotten writer and collaborator for the Batman character, Bill Finger, was particularly fascinating. Mr. Nobleman had to do extensive and difficult research to put together the pieces of the story and fill in some of the gaps, and ultimately his research led to DC Comics finally giving proper credit and giving some compensation to his only descendent. It was amazing to think research for a children's book led to such significant events. I honestly did not have high expectations for this conference, but I was very pleasantly surprised, and would highly recommend any of the above authors/illustrators to present at conferences, libraries, or classrooms. 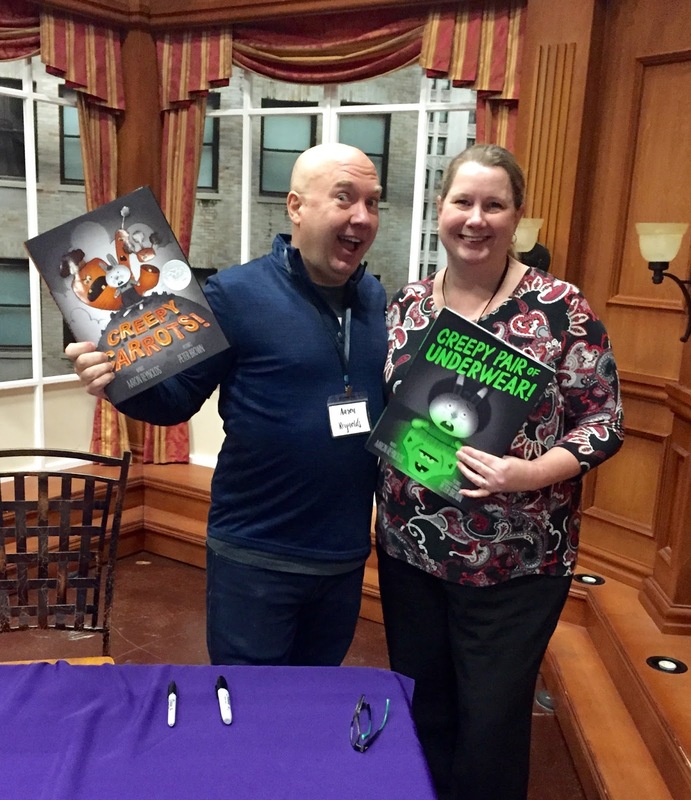 I ended the day with door prizes and having several signed books, so it was a win all around! * I should note that while the speakers were excellent, the conference has received a fair amount of criticism from the larger kid lit and library communities for the lack of diversity of the speakers and that it was hosted by a Christian college with discriminatory policies towards LGTBQ students, and rightfully so. While I enjoyed the conference, I was also bothered by the lack of diversity and noted that on the survey I filled out and suggested several diverse authors for future consideration, as well as following up with an e-mail. While the event organizers certainly deserve criticism for the lack of diversity among their invited speakers, I was saddened to hear that the speakers themselves have been targeted on social media, which I think is very unfair. The fault and responsibility lies squarely with the event organizers, not the speakers themselves, in my opinion.